COME SEE RAMSEY WINCH AT SEMA SHOW 2016 AT BOOTH#37147 IN THE SOUTH HALL! 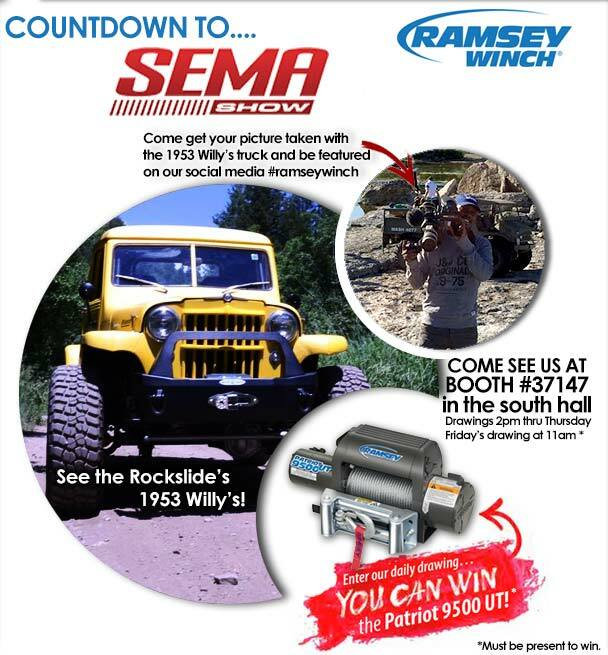 Ramsey Winch will be giving away a winch a day as well as featuring a custom 1953 Willy’s Truck! Headquartered in Tulsa, Okla., Ramsey Industries is comprised of three wholly owned subsidiaries that include Auto Crane, Eskridge and Ramsey Winch. Auto Crane designs and manufactures a comprehensive line of truck-mounted electric and hydraulic cranes, crane service bodies, crane control technologies, accessories, and mobile solutions for the energy, mining, construction, industrial, forestry and railroad industries. Eskridge is a leading designer, manufacturer and marketer of planetary gear drives and anchor drives, digger drives, and multiple-disc brakes. Ramsey Winch designs and manufactures industry-leading industrial and consumer winches for use in towing and recovery, industrial, petroleum, off-road and ATV vehicles.